The North Woods Two Drawer Log Nightstand is not the typical stand found in mega-furniture stores across the country. 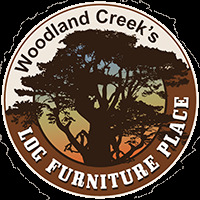 Your all wood rustic nightstand is hand crafted in the U.S.A. and will become a useful and cherished piece of log furniture in your home. The wood sides of this rustic nightstand drawer are joined together using dove-tail construction and its bottom is lined with aromatic red cedar. Drawer slides are epoxy-coated for years of trouble free, easy rolling use. The rustic North Woods One Drawer Log Nightstand is made entirely of pine with no veneer in its construction. If you like this nightstand, be sure to check out the rest of our North Woods Bedroom Collection. Free shipping when ordered with larger freight item from the same collection ($99 shipped alone).